The economy grew at an unflattering 1.3% annual rate in the second quarter, while first quarter GDP growth has been revised downwards to a wretched 0.4%. Against the backdrop of these abysmal numbers, the US government appears poised to do its best to make matters worse. Even if the debt limit negotiations generate an agreement, this is likely to entail a rather substantial anti-stimulus over the next couple of years. When combined with the expiration of the unemployment insurance extensions and of last year’s payroll tax cut, one can expect the US government to shortly be withdrawing somewhere on the order of a quarter of a trillion dollars from the economy. The forecasting group Macroeconomic Advisers estimates that, as a result of the possible debt limit deals alone, GDP will be roughly 0.1 percentage points lower next year, and up to almost 0.5 points lower in 2013. Again, it is useful to remind ourselves that this is purely self-inflicted. There is no requirement that budget savings be produced equal to the value of the rise in the debt ceiling—this is entirely a result of political strategy and political demands. And aside from the debt limit negotiations themselves, there is not much of a case to be made that reducing deficits in the near term in any way solves an emergent economic problem. Interest rates are low by historical standards and inflation remains in check. What’s more, key indicators show little evidence of expectations of increasing inflation down the road (for more on this, see the Levy Institute’s Public Policy Brief on the health of the recovery, containing useful numbers on measures of inflationary expectations). Debt and deficits are not some moral stain on the nation; they are simply a matter of economic accounting. And as such, with regard to the idea of reducing debt and deficit levels we must always ask: what problem is this supposed to solve? In a recent working paper, Levy Institute Research Associate Mathew Forstater provides a helpful primer (pp. 6-13) on three different ways of understanding the potential economic issues surrounding government debt and deficits: from a “deficit hawk,” “deficit dove,” and “functional finance” approach. Like many economists, I believe that the immediate crisis facing the United States economy is the jobs deficit, not the budget deficit. The magnitude of the jobs crisis is clearly illustrated by the jobs gap–currently around 12.3 million jobs. That is how many jobs the economy must add to return to its peak employment level before the 2008–9 recession and to absorb the 125,000 people who enter the labor force each month. At the current pace of recovery, the gap will be not closed until 2020 or later. In other words, we are not even close to full employment; moreover, as many have observed, inflation appears to be extremely low, with few signs that the stimulus measures taken up to now are bringing about an inflationary takeoff. Hence, it is straightforward to see the urgency of increasing job growth relative to worrying about rising prices, at least for the time being. Parenthetically, while macroeconomists rightly devote a great deal of attention to these cyclical issues, there are numerous pressing matters other than inflation and unemployment that figure in the recent budget debates in Washington. Many of these issues are at stake in the individual spending cuts and tax-code changes now being debated. Some of the changes being contemplated involve very large amounts of money and programs that are crucial to many people. There is a great danger that these concerns will be lost in the rush to meet an artificial deadline that could after all be eliminated immediately by a single act of legislation, with or without “action” on the deficit. With a near-consensus in the moderate camp on the need for temporary monetary and fiscal stimulus, I think it might be useful in a policy-oriented forum like this one to point out some of the potential contributions of more encompassing Keynesian approaches and of various post-Keynesian alternatives toward a better set of policies. One of the main issues dividing the mainstream Keynesian approach from these more-radical departures is the importance of the distinction between the short and long runs in deciding the role of macro policy in ending a recession or depression. Throughout the debate, the moderate Keynesians, who have managed to carry the day many times, have argued that Keynesian stimulus should come before serious belt-tightening designed to reduce the federal debt over the long haul. The rationale has been that “this too shall pass” in the longer run. But with weakening or mediocre economic data prevailing again recently, the long run appears to once again be the long run. The economy’s power to correct its own course is very much in doubt, but so also are the curative powers of modest stimulus bills in the medium and long runs. A more helpful role for government might be open, once there was an admission that more-permanent action is needed to solve an unemployment problem that no longer seems to be purely cyclical in nature, but nonetheless to clearly implicate a lack of aggregate demand. Such measures could include longer-term employment opportunities, as well as the creation of new mechanisms designed to automatically stimulate the job market whenever the economy begins to falter. In any case, the thought must be of longer-term policy-planning for adequate stimulus to both supply and demand. Will there be a Fed shutdown? “The debt ceiling applies to the face amount of obligations issued under Chapter 31 of Title 31 of the U.S. Code—basically, Treasury notes and bills and the other standard kinds of government debt—and the “face amount of obligations whose principal and interest are guaranteed by the United States Government.” But overdrafts on the Federal Reserve wouldn’t be Treasurys and they aren’t explicitly guaranteed by the U.S. government. “They’re more like unilateral gifts from the Fed. In normal times, when the federal government has not reached a Congressionally imposed ceiling on its debt issuance, the Fed would indeed honor all checks issued by the U.S. Treasury Department, whether or not Treasury securities had previously been issued in sufficient amounts to “cover” the checks. Carney may indeed be right that the debt limit law might permit this to continue after the debt limit has been reached on August 2. As pointed out by Carney, the legal issue would seem to turn on the question of whether the “overdrafts” to which he refers would be equivalent to federal debt under the relevant legislation. In my opinion, this would be good news, as federal debt limits are not helpful to the public interest. I have one additional thought to mention. In Carney’s scenario, it would be likely that banks would begin to accumulate excess reserves at the Fed, where they now earn one-quarter percent interest. 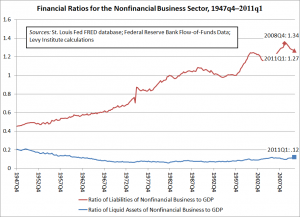 Hence, a large portion of the reserves created by the Fed to cover expenditures that would otherwise breach the debt limit would become earning assets for banks, with the Fed paying interest on these liabilities. 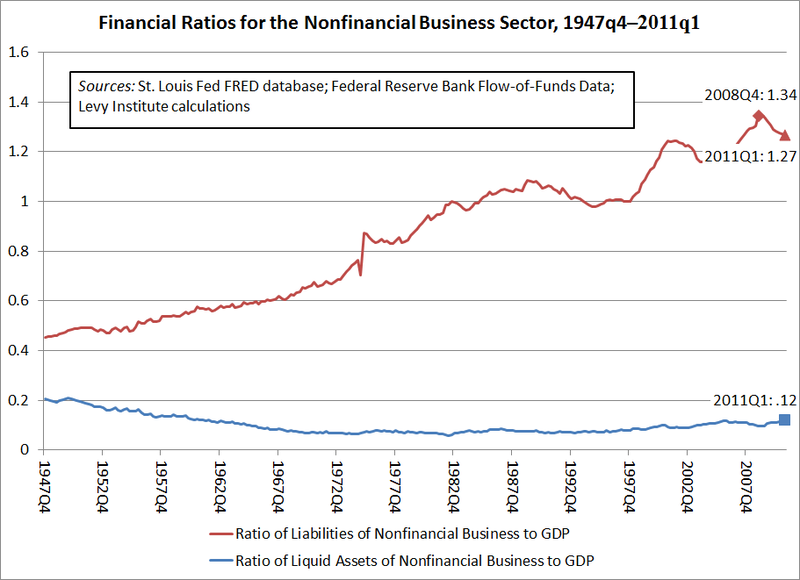 Legally, of course, reserve deposits at the Fed are liabilities of the Fed and not the federal government. Also, as Carney points out, banks and recipients of new government checks would seek to purchase existing fixed-income securities with some of the newly created money, probably putting downward pressure on yields. The Fed could then try to keep interest rates from falling by selling securities from its open-market portfolio. Hence, in Carney’s scenario, the Fed would most likely increase its liabilities and/or decrease its asset holdings by large amounts, a process that would in a sense compensate for the lack of new Treasury-security issuance. The question is whether this would be legal if the debt limit law was at issue. If the overdraft strategy turns out to be legal and acceptable to the main players, we could have a far better situation than one in which the federal government could not pay for its normal operations. Clarification, July 28: It should be duly noted that while August 2 is regarded as the hard-and-fast deadline for raising the debt ceiling, the federal government actually reached its debt limit in May. New debt issuance ceased at that point. The federal government has continued to pay its bills using “extraordinary measures” that were recently outlined by Treasury Secretary Geithner in materials posted here. These measures involve temporarily tapping certain government funds set aside for various purposes. The government has estimated that these alternative ways of funding government expenditures will be exhausted on August 2; hence, this is the date by which the resolution of the current impasse must occur according to the administration. This somewhat technical point was misstated in the post above, which implied that the legal debt limit would not be reached until August 2. We apologize for any confusion this may have caused. -G.H. 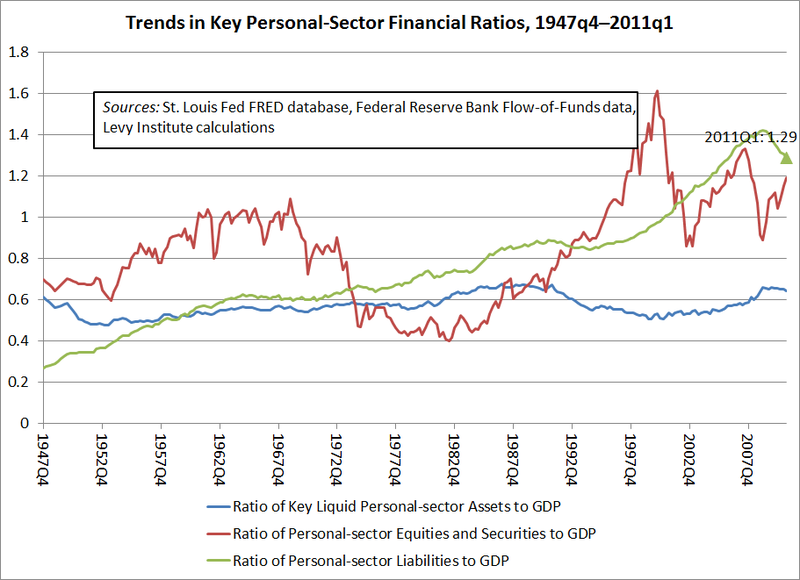 In the next figure, shown below, we can see that the personal sector (households, small businesses, and nonprofit organizations) has experienced increasing ratios of securities holdings to GDP in recent quarters, along with falling ratios of liquid assets to GDP. 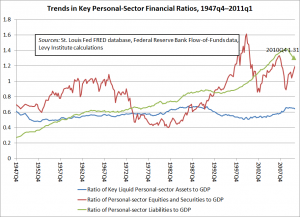 Moreover, as a percentage of GDP, the liabilities of this sector, too, have been falling. The falling private-sector debt-to-GDP ratios are not surprising in light of the recent financial crisis and the collapse of the real estate market, which not surprisingly led to a retrenchment in many forms of lending, as well as many defaults. Some will find it remarkable that private-sector debt has fallen so rapidly, but for a number of reasons, financial crises are typically followed by at least a partial turn toward financial conservatism and reregulation. Also, the weak economy has naturally curtailed the kinds of spending that are often fueled by new borrowing. On the other hand, the nearly relentless upward trends shown throughout both figures put more recent declines in private-sector debt into perspective. These long-run trends reflect what can be thought of loosely as a gradual increase in U.S. financial fragility beginning in the aftermath of World War II, in the 1940s. Levy Institute scholar Hyman Minsky was noted for observing this trend and warning of the threat it posed. Update, July 27, 2011: I have made a few changes to this post to improve its clarity. Also, to see all comments on this post, please click on the link below. -G.H. 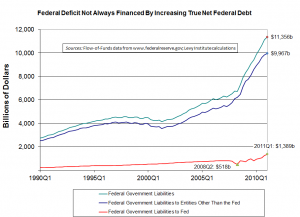 Do we need federal debt at all? Could the government loan the money to itself? The federal government is expected reach its debt limit of $14.29 trillion early next month. Normally, the government more or less indirectly sells a large amount of Treasury securities to the Fed, which is technically a private entity, separate from the familiar government run by the President, Congress, and the Supreme Court. This amount has been increasing rapidly, as shown by the red line in the figure above. As the figure suggests, quantitative easing II, or QEII, which officially ended last month, represents only the most recent version of this sort of open-market policy initiative, though it was highly unusual in that it involved very large purchases of Treasury bonds. Hence, even when the government finds that it has to borrow money to pay for its expenditures, it need not borrow from domestic or foreign private investors, or even foreign central banks or the International Monetary Fund (IMF). Instead, it can essentially turn to itself, borrowing from what is close to a government agency, charged with acting in the public interest. Nonetheless, unfortunately, official Treasury Department bond auctions will presumably cease if and when the federal borrowing limit is reached, rendering Fed purchases largely irrelevant to the resolution of Washington’s debt-limit predicament. Hence, the question arises: if the federal government doesn’t always borrow from the public when it sells bonds, but instead often relies on the Fed, why not dispense with Treasury bond sales altogether and have the Fed simply loan or even transfer funds directly to the federal government whenever tax revenues fall short of expenditures? It would obviously not be simple or easy to switch to such a monetary system, but at least until fairly recent times, most developed countries outside the English-speaking world found it best to provide liquidity for government activities in this way, avoiding the use of open-market operations and making their central banks more literally into instruments of the national governments involved. In such banking-oriented systems, private companies, too, tend to rely heavily on banks rather than financial markets when they need to obtain funds to build new plants, etc. Interest rates are mostly set directly by the banking system rather than in markets. Such financial systems have both advantages and disadvantages, relative to systems like the American one that rely far more heavily on securities and derivatives markets. In many ways, though, the two types of central bank are fundamentally the same, particularly in the way they are relied upon to help pay for government operations. The issue remains, though, is there anything to be gained by having specific numerical limits on government debt such as the ones imposed by the U.S. Congress? The answer is “no.” Keeping the current limit would only result in a self-imposed disaster. Update, July 21: Fellow Levy Institute scholar Randy Wray expresses some of the opinions and ideas set forth above in a great blog post that coincidentally appeared on the same day as the one above. G.H. Update, July 26: James Surowiecki argues to good effect that debt ceilings should be eliminated in a new article in the New Yorker. -G.H. 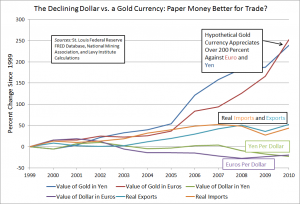 Should the Dollar Remain Independent of Gold? Some “gold bugs” advocate a return to the gold standard, which the United States officially abandoned in the early 1970s. The annual data in the chart above show that the price of gold has risen sharply in both euros and yen since 1999. Meanwhile, the dollar itself has fallen against both of the currencies, as shown by the lines near the bottom of the chart. Easy monetary policy has played a role in this drop. But a weakening currency has been one factor behind the recent increase in U.S. exports. The latter grew more than imports in percentage terms over the period shown in the figure. But nonetheless, both imports and exports grew by over 40 percent. It would have been difficult to increase exports at all with U.S. goods and services priced in a surging gold-backed currency. It goes without saying that the price of gold could possibly fall rather than rise in coming years. But dealing with a commodity money whose value can abruptly change in ways that harm the economy is always a severe drawback of a currency backed by gold. 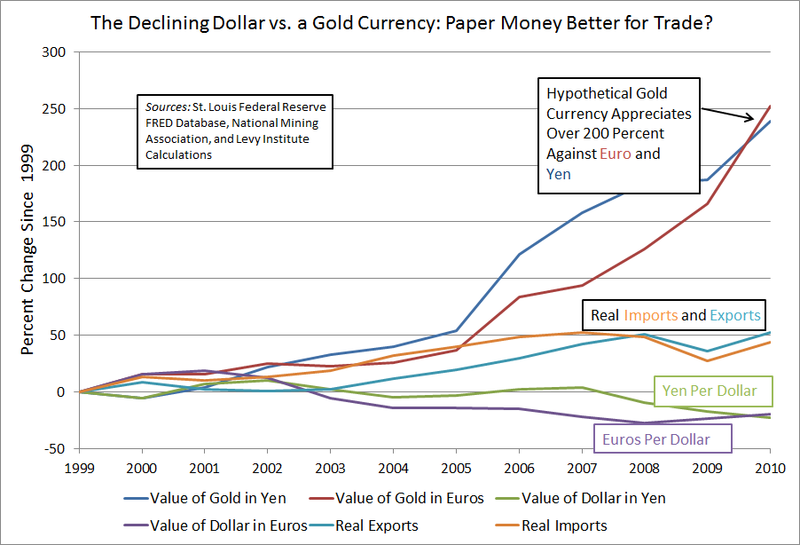 Of course, if the United States had adopted a gold-backed currency in 1999, U.S. wages, prices, etc. would likely have behaved much differently than they did. Hence, one cannot be sure what the outcome of a switch to the gold standard would have been. But these other changes could also easily have been detrimental to the health of the U.S. and world economies.